and watch your life miraculously transform! In the past millennia, humanity has explored ever new frontiers in an attempt to create a greater sense of well being and peace. In this Millennium a New Frontier has opened to an Inquiring Humanity who having attained technological advances of every kind, have failed to find peace in an ever changing and chaotic world. Uncharted and largely ignored, this New Territory began to be excavated in the last century by courageous explorers seeking to find answers to their life challenges and unhappy circumstances. This took them deep into the psyche. Called ‘The Last Frontier’, these Pioneers have made extraordinary discoveries and are bringing forth timely knowledge to assist a troubled humanity. 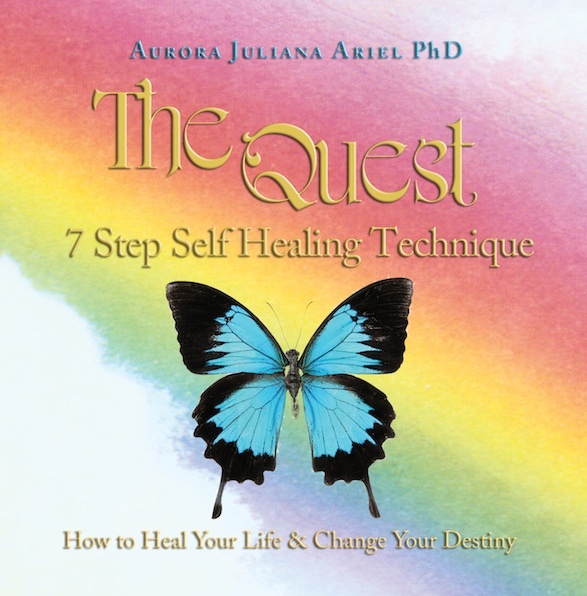 Emerging with new evidence from her years of research directly in the uncharted realms of the psyche, Aurora Juliana Ariel, PhD is bringing individuals around the world answers to age old questions, unlocking the mysterious Inner World of the Soul, demystifying the psyche, and training practitioners and lay people alike in Life Mastery skills and Self Healing, to assist them in realizing their Full Potential. Through her pioneering work, Dr. Ariel found the cause of suffering and why, when people work towards a better life, they so often fail to realize their greatest dreams. After mastering many of the cutting edge Counseling Theories and Practices of the last century, she went on to develop ‘TheQuest,’ and to distil it into seven powerful steps that are life changing and transforming. Consequently miracles are commonplace with her work. At last there is Light at the end of the tunnel. You no longer need to be burdened with the weight of your past. You can step free of disempowering personality traits, self esteem issues, negative relationship dynamics, health challenges, financial constraints, and other limiting conditions. to free yourself from a prison sentence of challenges that never end? TheQuest 7 Steps can set you Free! 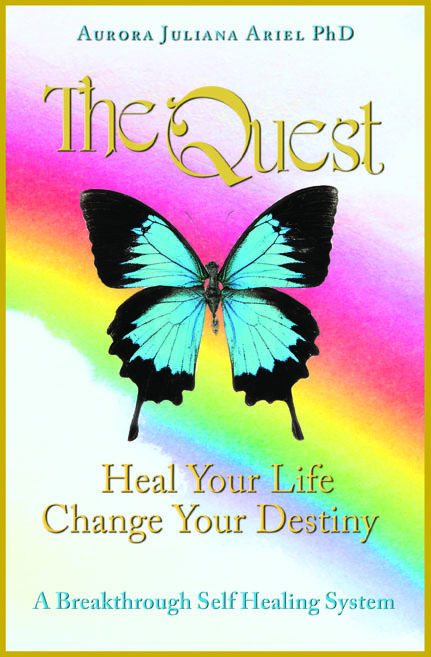 TheQuest is a rarified healing system that works at such a core level, subconscious patterns clear at lightning speed. TheQuest unblocked a subtle but powerful limitation in my life. TheQuest tools are like laser surgery for the soul. The operation is fast, relatively painless and totally effective. People would not choose to live with pain if they knew this was available. that one has no choice but to move forward in her Presence. I felt as if I had been bathed in the serene waters of the Holy Spirit! 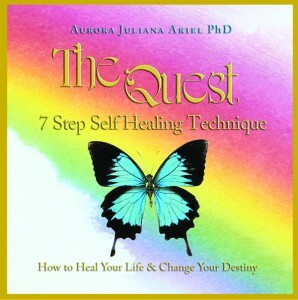 One of Dr. Aurora Ariel’s most exciting discoveries was finding that when you heal your life, you change your destiny. You do not need to reap the outcome of your family patterns or societal conditioning. You can step free and live the life you were meant for. You can fulfill a higher purpose rather than be relegated to a program dictated fate. When you have powerful tools like TheQuest, nothing can stop you or hold you back. The possibilities are limitless. 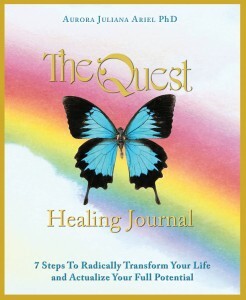 In this Healing Journal, Dr. Ariel lays out the 7 Step Self Healing process and unveils the secret formula to gaining greater mastery over your psychology and life. She shows you how easy it is to be in control of your emotions, patterns, and addictions rather than continuously run by them, how to go from upset to peace in minutes, and how you can live more often in your Authentic Self, which is always peaceful, positive, and proactive. This is the Miracle Consciousness that allows synchronicities and magic in your life. From this vantage point, you make wise decisions and take positive action steps. When you do this, you are actualizing your full potential and fulfilling your highest destiny. This is very different than fulfilling the fate dictated by unconscious patterns, which unfortunately is the norm on Earth. By doing this inner work, you can gain a comprehensive understanding of your shadow (unconscious patterns). By adding in TheQuest, taking your journaling to a whole new level and depth, this powerful Life Mastery Path can assist you in realizing your dreams and highest aspirations. with tools they can use for life."